We designed Soulitude as a guide into stillness. Soulitude lets consumers say goodbye to disrupting noise and light and enjoy traveling in peace. 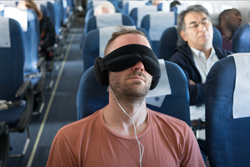 The sleep mask is designed with 100% breathable cotton, and its comfortable memory foam makes it easy for users to fall asleep and stay comfortable, whether they are traveling or simply in need of a quick power nap. The earmuffs are made of six parts to effectively keep sound out while lying comfortably on the ears. The inner shell is made of a thick plastic, followed by two layers of a super thick acoustic foam. The outer shell is isolated with a premium soft cushion foam. Additionally, Soulitude’s earmuffs fit over top of any set of normal earbuds for added noise reduction. Soulitude comes with a state-of-the-art travel bag, ideal for packing away while traveling. The advanced sleep mask is currently available on Kickstarter starting at $29. To learn more or to take advantage of early bird pricing, visit http://pr.fundl.ink/soulitude. Odd Company is an innovation agency consisting of a group of friends from Gothenburg, Sweden, making products that will improve consumer’s well-being. In short, the company believes that if one is feeling good, they will do good, which is something we need more of in today's world. To learn more, visit https://www.oddcompany.se/.